Born in Canberra, Peta MacKinnon’s (nee Gallagher) hockey career is a story of hard work, relentless effort and ultimately, great success. Peta learned the game on the pitches of Canberra, plying her trade but never really catching the attention of various junior representative programs. However, her hard work and passion for the sport began to pay off in 1993 when finally selected to represent the Territory for the first time as part of the Under 18 National Championships team. 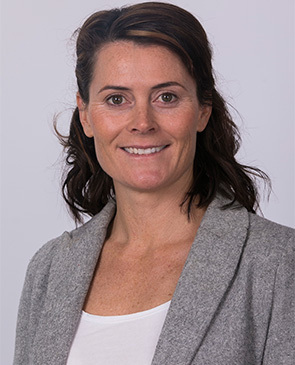 Continued good performances for the United Hockey Club, including premierships in 1995 and 1996, cemented Peta as a cornerstone of future ACT representative teams, while also helping press her case for selection to the Canberra Strikers in the Australian Hockey League (AHL). Making her Strikers debut in 1996 as a 19-year-old, Peta forged a distinguished domestic career, playing 155 games for the Strikers and scoring 48 goals. It would be six AHL campaigns before Peta made her international debut for the Hockeyroos on 22 April 2001. In an 83 match international career Peta would score 17 goals. An Olympian in 2004 in Athens, Peta also represented Australia at the 2002 World Cup in Perth and would play in four Champions Trophy Tournaments, including the Hockeyroos 2003 victory in Sydney. Peta would receive her highest accolade in her final year of international hockey. In 2007 she was nominated for the prestigious FIH Women’s Player of the Year, finishing runner up to the greatest female player of all time, Luciana Aymar. During her distinguished career, Peta played in domestic leagues in Ireland, New Zealand and Spain, while also continuing to be a dominant figure in local hockey. She was a key part of premierships with the University of Canberra in 2007, 2008 and 2011, was named to the Hockey ACT Women’s Team of the Year on 12 occasion and received the prestigious McKay Medal, as the best and fairest player in first division, in 1998 and 2005. Peta MacKinnon (Gallagher) is the 387th Hockeyroo and a fitting addition to the ACT Sport Hall of Fame.